In the fall of 2014, Professor Doug McKee taught Economics 131: Econometrics and Data Analysis, a required course for econ majors. During the semester, he experimented with several techniques to Once it was over, was able to take stock of what worked and what didn’t. One of the most promising techniques that he used in his class involved online discussions using Piazza: an online discussion board. Piazza is different than most discussion forum tools, because the students post questions, and then anyone, student or professor can answer and/or mark a given answer as correct. Ideally, then, students would answer each others’ questions, and the instructor would then chime in and simply verify which answer was the best. McKee was eager to participate in the conversations right from the start. In a class of 150 students, his students posted 492 questions and he answered 385 of them and contributed another 173 follow-up responses. It was a fair amount of work, but it meant everyone could read his answers and almost no one felt the need to come to office hours. While he missed the personal connections to be made during office hours, this system was a far more efficient use of everyone’s time. Fifty-six of 140 students responded; 62% said Piazza was very helpful, 36% said it was a little helpful and exactly one student said it was not helpful. 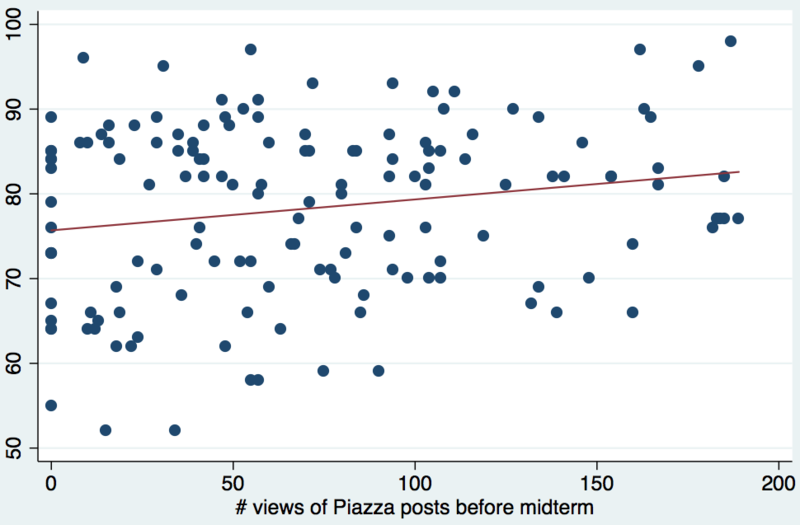 He also discovered that participation in Piazza is highly correlated with exam performance. 40% of students asked at least one question before the midterm exam, and they scored on average 3 points higher on that exam relative to students who posted no questions (p=0.09). 16% of students answered at least one question and scored 1.4 points higher on the midterm, but this wasn’t statistically significant (p=0.54). Total number of questions (and answers) viewed turns out to be the most predictive of midterm scores. The median number of views before the midterm was 60, and students who read at least this many scored 2.2 points higher on the exam (p=0.19). Students who viewed at least 100 (30% of the class) scored a highly significant 4.2 points higher than everyone else (p=0.02). Correlation does not equal causation, and it’s possible the students participating most in the discussion forums would have done better on the midterm anyway, but he nonetheless found these results to be encouraging. While any discussion board software probably would have improved the class, there are features of Piazza that make it particularly well-suited to a classroom environment. Students can answer each other’s questions and instructors can mark answers as good or provide their own answers. Instructors can mark questions as duplicates of other questions. Instructors can go straight to a list of all the unanswered questions or unresolved follow-up questions. It’s easy to put mathematical equations into posts using either a graphical interface or raw Latex code. Piazza won’t make every class better, but McKee thinks it’s a great match for almost any lecture-style class. All you need to do to get started is create your class on the Piazza web site and send the link to your students.